I have just moved over to the UK! Exciting times. 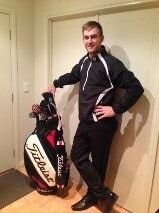 Due to not enough room in the luggage as I had to take work clothes I had to leave my clubs at home in Aus. I bought some older model stuff here which is alright but I'm missing my new stuff in AU as I got fitted just before I left and spent some big money with all upcharge shafts. How can I get my clubs posted here without it costing me an arm and a leg? Thanks in Advance!